How To Use The Telecommunication & Networking in Business Firms ? Currently technologies develop very fast, making it hard for people to keep up with them. The development of these technologies causes changes in all aspects of life. Regarding professional life, new technologies influence the way of working. Telecommuting is a new way of working, which makes use of those new technologies, in which high speed internet is most important. Telecommuting or tele work is a way of working in which an employee is able to stay at home and work on his or her own computer instead of having to go to an office. For the sake of cost reduction and global environment improvement, telecommuting is heavily recommended by lots of organisations. Telecommuting is a new way of working that is presented to be a environmentally cleaner, cheaper and more flexible way of working. However, could telecommuting be only positive for the employee and his or her employer? Telecommunication simply involves sharing information over a distance, which has made globalisation in business possible. Networking means forging connections with other business people and clients in order to maximise your opportunities for growth. Every small business should take advantage of emerging networking opportunities that use telecommunication to share its message with a broader audience. Telecommunication involves communication via email, which you probably already do frequently. It also involves sharing information via social-networking sites, websites and a blog. Software-sharing programs and web-conferencing programs allow for an instant exchange of ideas. Online chats are another example, and so are phone calls, including those between two parties or more than two individuals. Determine how telecommunication will most benefit your business, rather than haphazardly testing different strategies. For example, if you believe your products would succeed in another country, use web conferencing to build a strategic alliance with a company based in that country. If you wish to save on overhead costs and don’t need your employees to work on-site, use software that lets them collaborate on projects from a distance. Consider using phone conferencing to discuss ideas as a team in real time. Also consider hiring a virtual assistant to book appointments from a remote location if you don’t have a full-time assistant. Use telecommunications to improve communication when in-person communication is difficult or impossible. Don’t use it to eliminate all interpersonal interaction in the name of efficiency. If your employees work from home, have them meet in the office once a week to maintain a sense of team spirit. Many managers have used this strategy with great success. If you’re web-conferencing with someone who works half an hour away, an occasional lunch may benefit your relationship. Additionally, if you’re presenting in a web conference, remember that it can seem more difficult than an in-person presentation. Not seeing your audience can be daunting, and you probably won’t have any breaks for questions until the end, so practice giving your speech to a computer screen beforehand. Employees will probably respond positively to technologies that allow them to work from home or increase their productivity. In fact, they tend to become more productive when working remotely. Evaluate your changing communication systems to ensure they function at their best. Spending money on fancy new technology does not in itself ensure strong communication. Have your information-technology staff explain how to use communication tools to all staff members, and when web conferencing, have a knowledgeable IT staff member on hand. Introduce new technologies gradually, too, so you don’t overwhelm your employees or yourself. In today’s competitive corporate world, every business firm, whether small or large, has to make good use of modern communication technologies, in order to present a competitive and customer friendly approach. Effective communication has a key role to play in the success of every business, regardless of the medium used. As a faster medium of communication, small business phone systems have their own specific role to play in the smooth running of an organization. Whenever we talk about small business phone systems, the technology that comes to our minds is the Private Branch Exchange system, commonly referred to as PBX. It can be called the private telephone exchange of any business firm or office, but is often recommended as an economical option for firms, where the number of employees is greater than forty. Does your system have enough voicemail extensions so you won’t end up needing to add telephone company voicemail and adding a hefty bump in your phone budget. You need this feature to stay in touch with your customers and employees when you have to be out of the office. This keeps you from having to give everyone your cell or home phone number and helps to protect your privacy. Be sure the system you buy today can grow to accommodate the future needs of your company. 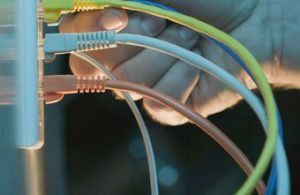 With Voice over IP technology and new advanced Internet telephony services, your phone system needs to be ready to connect to the IP network while keeping your connections to the traditional telephone network. Buy a hybrid systems that is built with SIP standards to ensure compatibility and avoid having to bury your business phone system before it’s time. 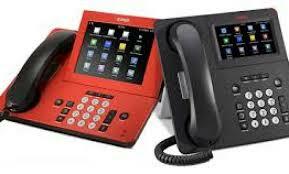 Small business phone systems don’t have to be limited. There are numerous choice available to the consumer to take care of all your phone system needs. You just need to shop carefully and make a wise choice.One of the hottest choices on the market today is the TalkSwitch system by Centrepoint Technologies. TalkSwitch, a hybrid phone system that offers IP and traditional telephony, is specifically designed for businesses with as few as one and as many as 32 phone users. The compactScience Articles, user-friendly TalkSwitch is a great example of the newer systems that provide the features of a PBX at prices that most small businesses can justify. The Ameo carries forward the timeless design language of Volkswagen successfully. The vehicle resembles the Polo and Vento from the front while the side (up to the C-pillar) will remind you of the Polo although changes have been made to the front fenders. The boot has been neatly integrated but the requirement of tucking under 4-metres in length does make the car look a bit awkward from certain angles. Still, this is one of the better looking compact sedans and the boot job doesn’t look like an after-thought. The only way to identify the diesel version from the petrol is the TDI badging on the boot. The superbly appointed interior is back too, with VW’s typically restrained-looking dashboard and exceptional fit and finish. The long equipment list on this Highline trim returns, replete with a touchscreen, rear-view camera, automatic wipers, cornering lamps, cruise control, two airbags and ABS. In fact, those last two safety features are standard across the range. The DSG auto version additionally gets ESC and a hill hold function. Finally, the rear seat – it isn’t the most spacious, especially on knee room, but if your use is only occasional, it might be good enough. 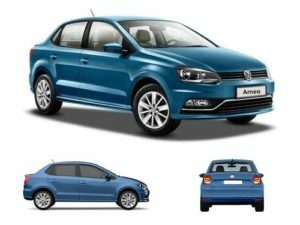 The Volkswagen Ameo is available with a 1.2-litre petrol and 1.5-litre diesel engine. The petrol is available with a five-speed manual and the diesel even has an option of a seven-speed DSG. The NVH levels on both the engines are a bit off. There is more than sufficient power in the petrol and the diesel is certainly a lot more powerful. The petrol engine is noisy and the diesel engine has a lot of clatter noise. Overtaking is a breeze with the diesel engine, however the petrol needs a downshift. The automatic version of the diesel is a lot more comfortable to drive and convenient to use. Drivability is good on both. The sudden boost after 1800rpm is reveling. There is always the joy of driving the diesel engine. Also, the clutch is a tad deeper than the petrol engine. The diesel clutch is heavy, which makes it difficult to drive in city traffic. The Ameo on the whole is a pretty nice car, especially when you consider the equipment you get for the money you pay along with the fact that it is a Volkswagen, and is thus a very well-engineered car. Volkswagen has learnt from its previous mistakes and is offering a bucket load features this time which adds to the Ameo’s value for money quotient. Build quality and quality of materials used is pretty good, which gives the Ameo a more premium feel. What’s more, it is a familiar looking car though that’s something which works in its favour but could also be a bit of a turn off for some. Not a deal breaker though, especially since it drives well, has a good balance of ride and handling, and of course the fact that this car has been made specifically for India. A little thing to be proud of, no? There is a new look about the Zest, yes, but there is also a little that remains from the Indigo CS. However, everything except the silhouette is new about the Zest. There’s a new grille that has taken inspiration from the old Indica grille, but is now a snazzy honeycomb design with a bolder logo on it. It is flanked by the headlamps, which remain a dual-barrel design but the top-spec versions now get a projector low beam with a corona ring. The fog lamps are housed in the new bumper that has a trapezoidal black center. The Revotron gets LED daytime running lamps, while the diesel auto we had sported a chrome accent under the fog lamp. The hood now has a ‘power bump’, which helps the sporty intentions. From the front three-quarter, the shoulder lines are what grab your attention. Never before has Tata made a car this aggressive in the bodywork, and it is a pleasant change. The wheel arches are flared a little, and this time they are adequately filled out by the 15-inch alloy wheels shod with 185/60 tyres. The fenders don’t have indicators on them any more, they have been relocated to the mirrors, and the bottom of the window line gets a subtle chrome strip. The diesel gets a multispoke design reminiscent of the Manza’s wheels, and the petrol, a new eight-spoke layout. There is no diamond-cut finish here, and the Zest doesn’t really need it, either. As with any other sub-four metre sedan, at the rear is where the proportions are odd, but the Zest does a fair job of hiding the height of the rear by breaking it up into the bumper with a matt black lower section that mirrors the front bumper, a bootlid with a numberplate and a generous chrome strip above it that links the tail lamps and a subtle lip on the top of the boot lid. The tail lamps are horizontal and wrap around the car’s corners a fair bit. The top-spec variants we drove even had LEDs with light guides on the top, linked to turning the headlamps on. 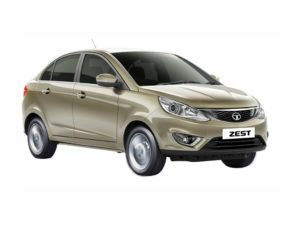 Overall, the Zest is a leap forward for Tata design, without making a clean break from the past. It is the right step forward and will definitely have heads turn, especially when they realise it is a Tata. A much bigger surprise is the cabin, which is easily the most modern and classy looking one we’ve seen in a Tata vehicle to date. The two-tone colour scheme makes it feel really airy, and the piano-black and gunmetal grey plastic trim do liven up the dashboard. The steering wheel is smaller in diameter than the Vista’s, it has a smart new hexagonal boss and there are audio controls here too. The speedo and rev counter dials are also very attractive, with a chunky-looking 3D jewelled effect, and a detailed fuel and trip computer nestled between them. It’s not just the look that’s improved, but the quality too. The texture and finish of the plastics look and feel much better to be on par with Maruti and Honda (though not quite at Hyundai’s level). If we’re going to nitpick, panel fit still isn’t perfect, the edges of certain parts are still quite rough, and the shiny plastics still reflect too much. It’s a shame that all the leather trim from the car shown at the Auto Expo 2014 is missing, even on the top-spec car, and that there is just one cup holder in the cabin; the slim door pads could barely fit a half-litre water bottle. A lot of work has been done to the seats as well, and the big front chairs are well cushioned and supportive. The high dashboard means shorter drivers might have to use the seat height-adjuster (only available on the top trim), but you will be comfortable over long journeys. The rear seat is like a sofa – easily wide enough for three, with good support and space in every direction. The air-conditioning – automatic climate control on the top-spec car, manual otherwise – has also been improved, and though we didn’t have a hot summer’s day to test it on, it regulated cabin temperatures very quickly and efficiently. Finally, another talking point on the inside is the new infotainment system developed with luxury audio experts Harman (of Harman and Kardon fame). The eight-speaker audio sounds fantastic for this class of car, and gets USB, Bluetooth, aux and SD card input (no CD player though). The touchscreen infotainment system on the top-spec car is very ambitious, offering higher-segment features like a proximity display for the rear parking sensors, alternate controls and display for the air-con, vehicle settings control, and even voice commands. It gets the job done, but is a little rough around the edges; the voice commands are too few and specific, for example. The screen is a bit too reflective to easily read on the move as well, but the unit itself feels really good to use, with high-quality controls. The lower-spec car misses out on the touchscreen, and with it, some of the aforementioned features, but its unit looks neat and works well. The Tata Zest is offered with the tried and test 1.3-litre Quadrajet diesel engine which produces the same output as it used to earlier. This engine is sourced from Fiat and is also popularly called as the “National Diesel Engine of India”. While offered with a 5-speed manual earlier, it now also gets paired to a 5-speed AMT automatic gearbox, making the Zest the cheapest diesel automatic in the country and also the only diesel automatic car in its segment. The bigger news is the new 1.2-litre Revotron petrol engine, which has been developed by Tata Motors in conjunction with AVL. It’s the first and only turbocharged petrol engine in its class.The 1.2-litre Revotron turbo engine uses an alloy head and a cast iron block, it belts out 90 PS at 5000 RPM and 140 Nm of torque at as low as 1750 RPM (up to 3500 RPM). The Zest gets a clutch lock and once you start the vehicle, you will really appreciate the low NVH levels, the motor is super refined with no vibes at all. In fact, the NVH is so good that at speed with the audio system playing, you can’t hear much of road, tyre or wind noise. Drivability is where the 1.2T Revotron mill truly shines, it offers an excellent low and mid-range punch but lacks top-end thrust. There is no turbo lag and performance is instant too, with power delivery being linear. The engine doesn’t rev quickly though and you do have to work the gearbox for quick overtakes, more so if the RPM drops below 2500 RPM in higher gears (4th and 5th). So for instance, driving at 90 km/hr in fifth and you stand on the pedal, the motor does take its time to pull, clearly fifth gear is for cruising. Redline comes in just under 6000 RPM with the tacho glowing red once you whizz past 5500 RPM. 100 km/hr comes up in third gear with the tacho ticking in at around 2300 RPM in top gear at the same speed, so the engine is relaxed when you want to maintain cruising speed on the highway. Tata Motors has tested the engine for 3 lakh hours and there are many highlights of this powertrain – 10% faster than the closest rival, highest power and torque density in it class, 23% better peak torque than the closest rival. The engine doesn’t sound sporty but you can hear the turbo whistle. This is not the motor which will put the tarmac on fire as it’s not tuned for high revs but drivability is its forte. Still, it does cut off smoothly when it hits the redline (like European cars) and doesn’t feel jerky there.While accelerating, if you lift off, the RPM doesn’t drop quickly, it increases a bit and then falls very slowly. First gear is good for 50 km/hr while second will see you do 90 km/hr. The engine won’t rev more than 5000 RPM in neutral. The Revotron engine also has a first in class drive mode selector (developed with Bosch), you can choose between Eco, City and Sport. By default, the car is in City mode and a touch of a button on the centre console changes the mode (which is reflected on the 2.5-inch display on the instrument cluster). This change happens on the fly and the Eco mode is aimed at mileage, the Sport mode boosts performance marginally while the City mode gives you the best of both (the throttle response is altered). You can feel the power trailing off a bit in Eco mode while the accelerator feels more instant in Sport, the 0-100 km/hr timings reflect the difference in different modes and the same is significant. The 5-speed gearbox offers smooth shifts and the clutch is light too. We can expect a mileage of 13-15 km/l from the petrol Zest. All the earlier issues of steering losing grip and wobbling on high speeds has completely gone. During out test drive in Goa, it was raining heavily but the ride quality of Zest held the wet roads firmly. The 185/60 R15 tyres have great traction. Even on rough patches, the suspensions refused to give up doing its best to keep the disturbance felt at the lowest level possible. It is evident that the team at Tata Motors has worked really hard to make sure the Zest delivers on points where Tata cars have been highly criticized for like ride and handling, in cabin noise insulation, gear shifts and steering response. Tata Zest comes equipped with Disc brake as front brake while Drum brake does the duties as the rear brake. This primary braking system responds instantly and to ensure much better braking, the company has also introduced the most advanced, the 9th generation Antilock Braking System (ABS) with Electronic Brake Distribution (EBD) as secondary braking system. Tata has also blessed the Zest with Speed dependent auto door lock system and Front and rear fog lamps. But unfortunately, the XE variants in both the guises miss out on these features. The company in a bid to avoid any mishap and make sure of maximum safety of the occupants, has also incorporated segment-first, the Corner Stability Control feature in the Tata Zest with mid and top trims. There are also dual front airbags and front seat belts with pre-tensioner & load limiter in the top-end trim. However, for the security of the vehicle; the company has come up with Immobiliser with every variant. But, the top-end trim XT also has a Perimetric alarm system that makes loud sound if any attempt of burglary or thievery is made. It must be said that Zest is probably Tata’s best and well coveted attempt to target most sort after compact sedan segment. It actually breaks away from what we Indians are used to seeing in Tata Motors product portfolio till date as this sedan brings forward the company’s latest design philosophy and engineering to conquer competition. In sheer performance, the petrol is the one that impresses the most while the availability of an automatic in diesel is definitely going to attract a great number of seekers. The attractive pricing at which the company has launched the Zest into the market, will surely pull a lot of customers towards it, especially when it comes to the first-in-segment diesel automatic variant. Honda was always in need to hit the small hatch segment and that was answered by the Brio. It was the small hatch of the small hatches. Small, usable, idea for the city and efficient and reliable thanks to Honda. The Brio came out in 2011 and was an instant hit. But as time passed so did the sales figures. Now in 2017 Honda has introduced the new Brio. 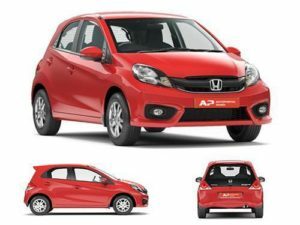 What are the changes in the new Honda Brio 2017? Are there any additional features? We share our detailed review of the new Honda Brio 2017. Honda Brio On road price starts from 4,73,597/- . Check for price details of Brio in CarzPrice. The Brio certainly is a looker. In this segment where classical designs are more appreciated than anything radical, the Brio has everything working in its favour. While it doesn’t have the sharp, funky lines of its rival, the Chevrolet Beat, or the radical futuristic styling of its elder sibling, the Jazz, it still manages to stand out in a crowd quite easily. The well proportioned stance with short overhangs is something that really gives the car a dynamic look. While Honda’s designers might want to describe the styling as ‘double triangle’ or the like in the language only automobile designers can speak and very few apart from their ilk can understand, what is clear to understand is that the Brio does look like it’s moving forward at a good clip even when its standing still, especially when viewed bang-on from the side. The engine on the New Honda Brio 2017 is the same 1.2-litre unit. This mill churns about 88bhp of power and 115Nm of torque. The mechanicals remain the same. This engine is mated to a five-speed manual and also a CVT (automatic transmission) option. This i-VTEC engine is a highly refined mill. The good bit about New Honda Brio 2017 engine is its performance. It has more than sufficient power to drive in the city. In fact it is quite peppy. One doesn’t need to change gears often while driving in the city. Even on the highway, it can comfortably cruise at about 100-110km/hr. The new Honda Brio 2017 mileage is about 14km/l in the city and about 16km/l on the highway. The automatic will return bout 12km/l and 14km/l in the city and the highway. The ARAI mileage for the Brio will be about 19 km/l and 20 km/l (for the automatic). The 88 bhp engine is responsive and is quick off the mark. Zipping around in city traffic is effortless especially with the automatic. The suspension is soft and takes care of most of the bad roads, undulations and speed breakers unless the car is heavily loaded with people, by that I mean all 4 people. The soft suspension does lower the car quite a bit. The car has a low centre of gravity still due to the soft suspension can’t be thrown around corners. If the signal is your start line you may be the 1st to heave a start. The automatic is responsive but the manual is quicker. If at all Honda had a glitch it would be the CVT automatic. That feels like a drag. The Brios overtakes efficiently too. Honda have ticked all the right boxed. 88 bhp, responsive throttle and 19 km/l. What else could you ask for in a small car. As I have mentioned before this would be an IDEAL car for Mr Bean in today’s world. The braking performance of the Brio is decent and on par with its rivals. The top version comes with ABS, further helping in the braking performance. The 175 mm-wide tyres also provide for a decent braking performance. The Brio is said to be capable of delivering fuel efficiency of 18.4 kmpl, compared to the Jazz’s 16.7 kmpl. So, one key buyer need in the segment has been taken care of well. The cabin is roomy and fairly well insulated for a car in this segment. Suspension set up includes McPherson struts at the front and H-shape torsion beam at the rear. The ride is not the most pliant, but is fairly dynamic again for a car in this segment. The Brio is likely to be offered with four variants, with the top two variants featuring all the safety features like ABS, EBD and dual front airbags.